Get yourself ready to take a spin on the Spectacular Wheel of Wealth! Click here to play! There is an abundance of cash on offer for brilliant spins, and the simplicity of a fixed value wager. Spectacular Wheel of Wealth is a wonderful 3-reel slot played across a single pay line. The Spectacular logo is Wild and can be substituted for any other symbol on the reels except Triggers. 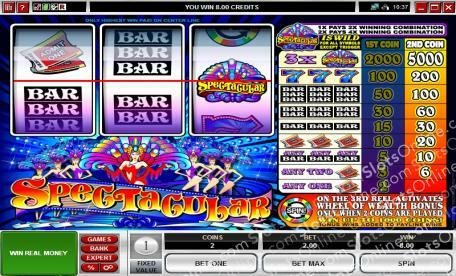 Whenever the Spectacular logo is used in a winning combination, the payout will be doubled. Additionally, if you manage all three Spectaculars on the pay line you will win yourself up to 5000 times your wager! The Spin symbol will activate the special Bonus Feature when it appears on the pay line on the third reel. Once inside, you must spin the Spectacular Wheel of Wealth in order to reveal amazing prizes! The wait is over; it's time to start playing the Spectacular Wheel of Wealth today! The Spectacular Wheel of Wealth logo is Wild and can be substituted for any other symbol except Spins. When you get all three on the pay line you will win up to 5000 times your initial stake. The Bonus Game is triggered when the Spin symbol appears on the third reel pay line. Once activated, you must spin the Spectacular Wheel of Wealth for your chance at massive cash winnings.